We have 20 stewardship projects planned for 2016, 13 of which are on weekdays this year. We will include a short field trip on each project to see some of the preserve we are working at. DNAP may provide a vehicle from their Columbus office for projects which are a longer drive from Columbus, more than 90 minutes. And finally, we plan to offer volunteer training this month, on February 20th, and a volunteer appreciation picnic in late summer or early fall. Registration: Please let us know you are joining us, sign up HERE. ​please complete our ​Volunteer forms found HERE. Volunteer Hours: At the completion of a project, please enter your time (Including travel time to and from the site) HERE. The Milford Center Prairie Natural Area is a very significant prairie remnant of the Darby Plains owned by Dayton Power & Light, but managed in cooperation with DNAP. It is approximately 1.5 miles in length beneath the power lines with more than 50 different species of prairie plants, including rare species such as royal catchfly. Unfortunately it has been neglected for several years, so ONAPA volunteers will be helping DNAP control the common teasel that has started to invade the prairie. Our project entails the following: We will be removing woody species and teasel. Directions: Driving Directions HERE. Meet at the parking area located on Connor Road, just north off of State Route 4, west of Milford Center. We will park in the pull-off area on Connor Road near the power line crossing and walk down the DP&L power line ROW for the work trip. What to bring: Lunch, water, tools (if you have any loppers, pruners, handsaws, shovels, etc. ), and gloves. RSVP: To sign up, click HERE. 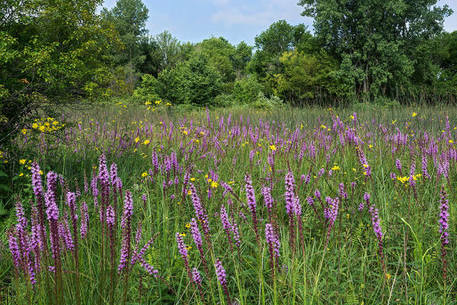 The most notable botanical feature at Boch Hollow is the extensive population of the Federally Endangered Running Buffalo Clover – the largest such population in Ohio. Unique among Ohio’s preserves is the mission of Boch Hollow to serve as an educational site for hands-on environmental education of Appalachian Ohio ecology. Primarily geared toward local school children, the staff also provides programs to the general public as well as various civic and environmental organizations. ​Directions: Driving directions HERE. From Columbus travel east on US 33 and take the Tarkiln Road exit. Turn left at the bottom of the ramp and proceed straight through the light at Business route 33 onto Horn’s Mill road. Travel approximately 4.8 miles on Horn’s Mill Road. As road enters Hocking County, it becomes Hide-Away-Hills Rd. Continue on Hide-Away-Hills Road approximately 4.1 miles to intersection with SR 664. Turn right on SR 664 and travel approximately 0.4 mile. Turn left onto Beach Camp Road and travel approximately 1 mile and turn right into the driveway at Boch Hollow SNP. What to bring: Lunch, water, waterproof or rubber boots, gloves. Olsen State Nature Preserve features ridge top oaks and maples towering above a mixed floodplain forest and the Vermilion River. The river, which runs in a huge bend around the preserve, has created many small plant communities with different exposures offering a great deal of diversity in a relatively small area. Both the River Loop Trail and the River Trail offer excellent wildflower viewing, as well as American chestnut trees. The Sassafras Trail features one of the largest sassafras trees in the state, as well as spectacular views high above the river on a ridge of serviceberry and witch-hazel. ​Directions: Located about 1 mile north of Wakeman on West River road. Driving directions HERE. Lake Katharine is a magnificent forested nature preserve of over 2,000 acres in Jackson County. It has a beautiful lake and over 6 miles of hiking trails, surrounded by spring wildflowers and many rare plants including the big leaf magnolia. Garlic mustard is one of the invasive plants that needs to be controlled to preserve wildflower diversity, particularly in the bottomlands. What our project entails: This project will include removal of invasive woody species, as well as garlic mustard removal. Directions: Meet at the main parking lot near the maintenance building. The parking lot can be reached by taking State Street west out of Jackson about 2 miles, then turning right on County Road 85 (Lake Katharine Road) and proceeding 2 miles. Driving directions HERE. This natural area, located on the Sandusky State Scenic River, was originally acquired as a Scenic River area. The large wooded riverine corridor contains large oaks, sycamore, ash, tulip and cottonwoods, as well as a spectacular diversity of spring wildflowers including sharp-lobed hepatica, Dutchman's breeches, squirrel-corn, three trillium species, twinleaf, white and yellow trout-lily and marsh marigold. The display of marsh marigolds and skunk cabbage found in the floodplain is particularly striking in early May. What our project entails: Collier has a wonderful spring wildflower display and we will be pulling garlic mustard. Directions: Driving directions HERE. Located approximately 3 miles northeast of McCutchenville at the southwestern edge of Seneca County. From McCutchenville, proceed 3 miles east on County Rd 58, then .5 mile north on Township Rd 131, and .25 mile east on Township Rd 38. What to bring: Lunch, water, waterproof or rubber boots, gloves and a shovel. 8:30 a.m. if enough volunteers sign up. Meet at closest parking lot to guard station. Let us know if you will be using the van. Chaparral Prairie State Nature Preserve features 120 acres of prairies, glade openings, and woodlands. This preserve is best viewed in mid to late summer. It has very unique flora, featuring prairie dock, dense blazing-star, pink milkwort, blackjack oak and much more. 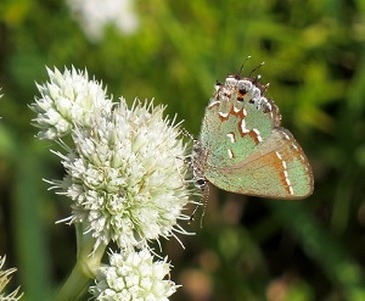 This preserve has one of largest populations of rattlesnake master in the state. Our newest addition, purchased by the Arc of Appalachia in 2015, features a new 1.2 mile trail extension. The new trail, Bald Hill and the Cedar Barrens trail, has a large population of dense blazing-star and a beautiful view of the rolling Adams County countryside. Our project will include removing yellow and white sweet-clover, and common teasel which are invasive plant species throughout the preserve. Control will include pulling and using a small digging spade, if applicable. Yellow and white sweet-clovers are biennial herbs which become very bushy in the second year. Common teasel is also a biennial that grows as a rosette its first year, and then it sends up a flowering stalk the next. Directions: Located about 3 miles north of West Union, follow State Route 247 to Chaparral Rd. to 209 Hawk Hill Rd. Directions to meet the van at Fountain Square, 2045 Morse Road, Columbus, OH: (The day before the project, please confirm with us that a van will be leaving.) Take I-71 exit 116 (Sinclair & Morse Road). Drive east on Morse Road and pass Karl Road and pass Northland Park. Turn right at Heaton Road at light (Turkey Hill Gas Station). Make an immediate left on Morse Rd access road. Turn right at the 2045 ODNR entrance sign. What to Bring: Lunch, water, hat, boots, tick spray or repellents, digging tool. Daughmer Prairie Savannah is one of the finest prairie savannas in the country. It is a state nature preserve managed by Crawford Park District. The prairie has been grazed, but never farmed. Ever since ODNR purchased the site in 2011 and the sheep were removed, a number of invasive species have appeared, most troublesome being common teasel. Work projects here over the last several years have greatly reduced common teasel numbers, but as yet, it has not been totally eradicated from the preserve. We will be cutting the flower heads off any plants getting ready to flower, then using a shovel to cut down on an angle about 4-5 inches below the base of the plant to sever the tap root, and then pull the mature plant or rosette out of the ground. Directions: Meet at the parking lot located at 786 Marion-Melmore Road, one mile north of State Route 294, in Crawford County about 9 miles southwest of Bucyrus. What to bring: Bring lunch, work gloves, long-sleeved shirt and pants, work boots, a long-handle shovel, tick spray or repellent, and hand pruners or scissors. Soft drinks and water will be provided. Clifton Gorge protects one of the best examples of post-glacial and inter-glacial canyon cutting. The Silurian limestone and dolomite bedrock supports an abundance of plant life, including at least 347 species of wildflowers and 105 species of trees and shrubs. The cool north-facing slopes provide much needed moist, shady habitat for northern relics such as hemlock, Canada yew, arborvitae, red baneberry and mountain maple. The Little Miami River, which is a state and national scenic river, is another feature worthy of noting at this site. Clifton Gorge was designated a National Natural Landmark by the U.S. Department of the Interior in 1968. The limestone bedrock here provides an ideal habitat for bush honeysuckle, and other invasive shrubs. This project will focus on removal of these shrubs in sensitive areas in the preserve. We will be working on the south side of the river which is the scientific research side and usually requires an access permit to enter. We will be cutting shrubs and treating the stumps with herbicide to prevent re-sprouting. Smaller shrubs may be pulled and removed from the site. Herbicide treatment will be done by DNAP staff or trained ONAPA volunteers. Directions: Park at the main Clifton Gorge Preserve parking lot just west of Clifton on State Route 343. What to Bring: Bring lunch, water, loppers, and gloves. Johnson Woods is one of Ohio's largest and best remaining old-growth forests. Many trees rise 40-50 feet before the first limbs occur and several are more than 400 years old. Some are 120 feet tall with a diameter of 4 to 5 feet. This woodland historically was known as Graber Woods and was studied by the renowned ecologist, Dr. E. Lucy Braun, who recognized its significance. The largest trees, then and now, are white oaks, red oaks and hickories. We will be removing invasive woody species such as bush honeysuckle, Japanese barberry, multiflora rose, as well as Japanese knotweed with a combination of cutting and herbicide treatment, hand pulling, and foliar spraying for the knotweed. Herbicide treatment will be done by DNAP staff or trained ONAPA volunteers. Directions: Located in Wayne County approximately 4 miles north of Orrville on State Route 57, then 1 mile east on Fox Lake Road. What to bring: Bring lunch, water, loppers, rubber/leather gloves, and muck boots. Myersville Fen is a small, 27-acre wetland owned by the City of Green that contains two small fen meadows. It is one of only two fens in Ohio containing the naturally occurring, state-listed pitcher-plant (Sarracenia purpurea). Surrounded by a housing development and besieged by invasive plants, Myersville Fen is truly an island of unique plants under constant threat and in need of persistent stewardship. We will be removing invasive plant species, such as narrow-leaved and hybrid cattail and glossy buckthorn, which are encroaching upon the fen meadows. We will be cutting the stems and treating them with herbicide. Herbicide treatment will be done by DNAP staff or trained ONAPA volunteers. Directions: Two miles west of Interstate 77, take State Route 241 to State Route 619 west, then to Myersville Rd. Turn south on Myersville Rd. to Turtle Bay Circle. Park at the corner of Turtle Bay Circle and Myersville Rd. Jackson Bog, which is actually a fen, or alkaline wetland, lies at the foot of a dry, sandy kame (a glacially deposited hill or ridge). The belts of kames in this area of Stark County provide an extensive aquifer. These highly permeable gravel deposits readily absorb surface water and then hold it in staggering quantities as groundwater. The alkalinity is a limiting factor which dictates the types of unique plants which will grow there. We will be removing invasive plant species, such as narrow-leaved and hybrid cattail, glossy buckthorn, privet, and purple loosestrife, which are encroaching upon the fen meadows. We will be cutting, treating stems with herbicide, and removing the cut stems from the fen meadows. Herbicide treatment will be done by DNAP staff or trained ONAPA volunteers. Directions: Located in Stark County, 2 miles north of Massillon on Fulton Drive and a 1/2 mile west of the intersection of State Route 687 and State Route 241. The preserve is adjacent to Jackson Township Park. What to bring: Bring lunch, water, loppers, rubber/leather gloves and muck boots. This high quality spring-fed alkaline wetland is an exceptionally fine example of a prairie fen community in the state and protects at least 27 state-listed species. In addition to protecting the prairie fen ecosystem, a secondary management goal is to perpetuate the bur oak savanna-prairie community and to restore the oak woodlands-barren community on the uplands at this site. The goal of this project will be to focus on the secondary preserve management goals. We will be cutting and treating the stumps of bush honeysuckle (primarily Amur), as well as any other invasive shrubs in these communities. Herbicide treatment will be done by DNAP staff or trained ONAPA volunteers.​. Directions: The grass parking area is located on the south side of Old Columbus Road between Bird Road and Redmond Road. Springville Marsh is an unequaled nature preserve in northwestern Ohio as it is the largest inland wetland in this part of the state. Growing within the preserve are several Canadian and Atlantic coastal plain species, which became established here shortly after the Ice Age. 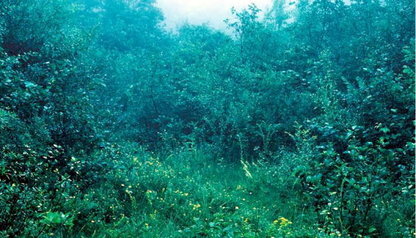 Some of these plants are threatened and endangered species in Ohio. Fen orchids, bottle gentian, Kalm's lobelia and little yellow sedge can be seen along the boardwalk. One of Ohio's largest populations of twig-rush, a typical Atlantic coastal plain species, is located in the remaining sedge meadows. There are also smaller areas of more northern plants, such as Ohio goldenrod, grass-of-parnassus, and shrubby cinquefoil. The sedge meadows, shrubby thickets and vast areas of cattail marsh also provide excellent opportunities to observe wildlife. Our project includes hand-wicking (applying herbicide with gloves & old socks) narrow-leaved cattail and cutting woody species in the sedge meadows. This cattail is very aggressive and will crowd out the native sedge meadow species. We will use the hand-wicking technique in the high-quality meadow areas as this reduces the chances of accidentally spraying non-target species. Cut stems of woody species will also be treated with herbicide. Herbicide treatment will be done by DNAP staff or trained ONAPA volunteers. Directions: Located in Seneca County, 3 1/2 miles north of Carey on U.S. Route 23 / SR 199; then proceed 1 mile west on Township Road 24 (Muck Road) to the preserve parking lot. What to bring: Bring lunch, water, loppers, waterproof or rubber boots, and gloves. Mosquito repellent may be needed. ​​​​10 a.m. - 4 p.m.
One of the largest and finest prairie fens remaining in Ohio, Prairie Road Fen is a 97-acre gem tucked away in northern Clark County. Access to this site is usually by permit only due to the fragile nature of this site. The ground water emerging here is cold, calcareous and oxygen-deficient which provides a harsh habitat that only a number of specially-adapted plants can tolerate. Intermingled with the fen plants are relics of a time when a prairie extension thrived in this part of Ohio. This prairie fen complex is another unique feature of this site. The goal of this project is to remove woody vegetation in the fen meadow, which by means of succession, are invading the fen meadows. We will target all woody species, but glossy buckthorn will be the primary species of concern. We will also target a non-native invasive grass, reed canary grass, from a few areas where it is beginning to invade. To control woody vegetation, we will cut and treat the stems with herbicide. A few herbicide applicators will focus on the reed canary grass patches which will be sprayed with backpack sprayers. Herbicide treatment will be done by DNAP staff or trained ONAPA volunteers. Directions: We will meet at the Buck Creek State Park office and carpool to the preserve. The office is located near the park entrance, north of the junction of Robert Eastman Road and Buck Creek Lane. What to bring: Please bring lunch, water, loppers, waterproof boots, and gloves. Kent Bog is a living relict from the Ice Age. In glacial times, the boreal forest, including tamarack, dominated the landscape far south of northern Ohio. Today, however, Kent Bog supports the largest, southernmost stand of tamarack in the continental United States. There are over 3,500 tamaracks in the population with many robust seedlings growing among the larger trees. Here, too, is a fine population of gray birch, also a tree of more northern distribution. Gray Birch and tamarack are both potentially threatened species in Ohio. We will be removing invasive glossy buckthorn using a combination of cutting and treating the cut stems with herbicide, as well as hand pulling seedlings (which are numerous). Trained DNAP staff and ONAPA volunteers will conduct the herbicide application. Directions: From I-76 east, take the Kent exit (SR 43) north to Meloy Road, then head west (turn left) to the parking lot. What to bring: Bring lunch, water, rubber/leather gloves and muck/knee boots. Brinkhaven Oak Barrens was designated as a state natural landmark in 2005 for being the best example in north central Ohio of what famous Ohio ecologist, Paul Sears called “oak openings.” The 114-acre preserve owned by the private non-profit organization, Killbuck Watershed Land Trust, protects two oak barrens containing 6 state-listed plants, including the threatened thyme-leaved pinweed. ONAPA has been assisting the KWLT with habitat management recently to restore the two oak openings. We will likely work in the northern opening, as the southern opening has had significant clearing in the past two years, as well as a spring burn in April 2016. We will be cutting larger woody stems and treating the cut stems with herbicide. Trained DNAP staff and ONAPA volunteers will conduct the herbicide application. Directions: From Brinkhaven (Gann) on U.S. Rt. 62, drive about 4 ¼ miles east on U.S. Route 62 to Holmes Co. Rd. 25. Drive about ¾ mile north to an intersection and turn left (west) on to Township Road 13. Drive for about 1.2 miles and the parking lot will be on the right. The parking lot is about 500 feet beyond the old railroad overpass, on the right (hard to see as it is a grass parking lot with no signage). ​What to bring: Bring lunch, water, hiking boots, gloves, and hand tools such as hand saws, loppers (if you wish). ONAPA and KWLT will provide tools. A microcosm of the botanically significant Oak Openings region in northwest Ohio, Campbell State Nature Preserve is home to more than 40 state-listed species. High-quality habitats include wet sedge meadows, swamp forest, sand dunes, sand barrens prairie, and oak openings. Rare wildflowers found here include wild lupine, grass-pink orchid, spathulate-leaved sundew, soapwort gentian, plains puccoon, and Missouri ironweed. The varieties of habitat provide a landscape for endangered wildlife, including the frosted elfin and harvester butterflies. Our project includes removing invasive woody shrubs from the open meadows. Species that will be controlled include autumn-olive, glossy buckthorn, common buckthorn, bush honeysuckle, European black alder, and Oriental bittersweet. We will be using the cut stump treatment method. Each shrub will be cut with loppers and the stump will be treated with herbicide to prevent re-sprouting. Trained DNAP staff and ONAPA volunteers will conduct the herbicide application. Directions: Located east of the Toledo Express Airport along Crissey Road, south of State Route 2. There is a small parking lot with a sign on Crissey Road. What to bring: Lunch, water, work boots, gloves. Waterproof boots will only be needed if excessive rain occurs before trip. ONAPA and DNAP will provide tools. Bonnett Pond Bog State Nature Preserve is a small, 16-acre, high-quality sphagnum kettle-hole bog. A floating sphagnum mat with bog plants such as large cranberry, poison sumac, round-leaved sundew, swamp loosestrife, little prickly sedge, white beak-rush, highbush blueberry, and glaucous sedge surround the dark acidic waters of the bog lake. There are some large trees on the wooded slopes surrounding the kettle-hole bog. 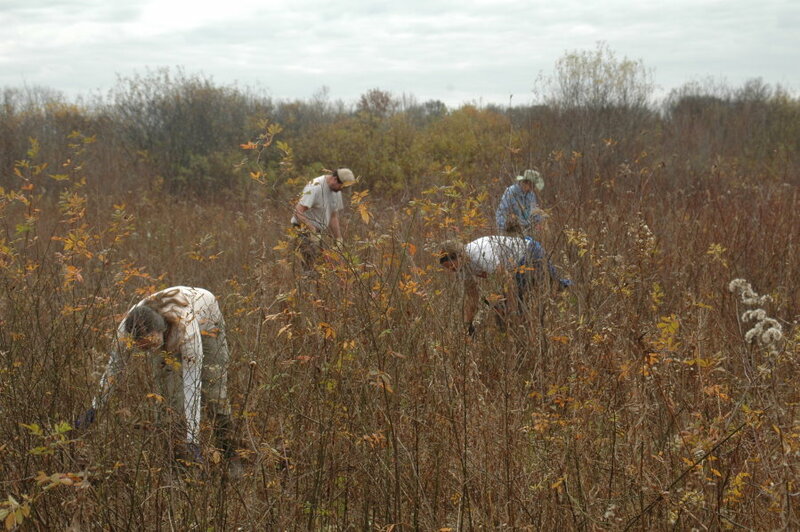 Our project includes removing woody shrubs such as highbush blueberry from the bog meadow. We will be using the cut stump treatment method. Each shrub will be cut with loppers and the stump will be treated with herbicide to prevent re-sprouting. Trained DNAP staff and ONAPA volunteers will conduct the herbicide application. Note that poison sumac is present in this bog, so special care will be taken to avoid it. Directions: In Washington Township, the preserve is located on State Route 179. From Loudonville, proceed northeast on SR 3. Turn right on SR 179. The preserve will be on the left before you reach Lakeville. Parking is very limited; a few cars can park at the edge of the field near the electric substation, while others may need to park at the intersection of SR 3 and SR 179 (and be shuttled to the preserve). The preserve is mostly wooded and you will see state nature preserve boundary signs from the road. Due to the lack of facilities and the sensitive species present in the small bog, access is usually by permit only from the Division of Natural Areas and Preserves. What to bring: Lunch, water, muck/knee boots, and gloves. ONAPA and DNAP will provide tools. Chaparral Prairie State Nature Preserve features 120 acres of prairies, cedar barrens, and woodlands. This preserve is best viewed in mid to late summer. It has very unique flora, featuring prairie dock, dense blazing star, pink milkwort, blackjack oak, and much more. This preserve has one of largest populations of rattle-snake master in the state. Our newest addition, purchased by the Arc of Appalachia in 2015, features a new 1.2- mile trail extension. The new trail, Bald Hill and the Cedar Barrens trail, has a large population of dense blazing star and a beautiful view of the rolling Adams County countryside. Our project will include cutting autumn-olive and other invading woody species on the new parcel. Cut stems will be treated by trained DNAP staff and ONAPA volunteers. Autumn olive is a non-native, invasive deciduous shrub that can grow up to 20 ft. Its cream to pale yellow flowers bloom in early spring and produce an abundance of pink to red berries dotted with scales. The leaves of the plant are elliptically shaped with a slightly wavy margin. Directions: Located about 3 miles north of West Union, proceed on SR 247 to Chaparral Road, then to the preserve at 209 Hawk Hill Road. There is a parking lot located at the maintenance building. We will meet there, then proceed to the new parcel to begin work. Restrooms are present at the maintenance building. What to Bring: Lunch, water, hat, hiking boots, insect repellent. DNAP and ONAPA will provide tools. This site is a small wetland, primarily an alkaline wet sedge meadow surrounded by farm fields, and is owned by the City of Dayton’s Water Department as a wellfield. The U.S. Fish & Wildlife Service and DNAP have been cooperating with the City of Dayton by verbal agreement since a significant population of the Eastern prairie fringed orchid was reported at this site in 1993. Regular habitat management is necessary to maintain the open sedge meadow, which has been declining for several years due to woody species encroachment. ONAPA will be cooperating with USFWS and DNAP on this project to cut and treat woody species in the area where most of the orchids are located. Directions: From Columbus, proceed west on I-70. Take exit 26B to exit onto Spangler Road north towards Medway. After crossing the Mad River, turn right on to Union Road. The site, owned by the City of Dayton, Water Department, is on the right. Parking will be along the roadside. What to Bring: Lunch, water, hat, muck/knee boots, insect repellent. DNAP, USFWS, and ONAPA will provide tools. We will bring some tools, but we encourage participants to bring some as well. ​Registration will be available soon.